What would you do if you were certain that you had discovered a work of art not so much lost as mythical? A painting beyond value which is being used by rich rural idiots to block the fireplace. Horrible, unhinged, feckless Martin Clay makes that decision instantaneously in Michael Frayn’s Headlong. and then dithers about it until the reader wants to cry. This is a marvellous, unusual and comic book with some weaknesses – for one, the reader will learn more than s/he need ever know about Breugels both with and without “h”s, elder and younger and the bitter relationship between the Netherlands and Spain. I admit to having ‘skimmed’ these sections – a loathsome habit – but they are rather boring to the non-art-smart reader who may be almost as confused by it all as Martin is. The other weakness of the novel is a laughable sexual infatuation and a rather farcical, disappointing ending. But, contemporary fiction seems to have to include boring learned lectury bits, gratuitous sexual obsession and endings that have run out of gas. Frayn can be forgiven these ubiquitous failings because this is a classic. Every bit as good as Sweet Dreams. P agrees, but perhaps appreciated the Breugelian discourses more, although admittedly, by about page 340, grew a little weary at yet another historicist rant, albeit doubtless inserted to emphasise the narrator’s idée fixe. Headlong is a truly great comic novel, a faux-Flemish waterboarding full of hilarious pain and destruction. 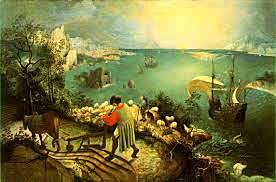 One more thing: some current opinion doubts that the wonderfully bizarre painting of a sea scene, with Icarus plunging headlong into the sea as almost a marginal note (see above) was done by a Breugel.